WHEN the 20 000 women of 1956 ignored the call by men to abandon plans to march to the Union Buildings simply because they were women, they set the benchmark for strength in unity. That is where the women of today should move from to become leaders, Minister for Women in the Presidency Susan Shabangu said yesterday. She said the women defied the state and men of the time to unite in a show of force and in defiance of patriarchy. 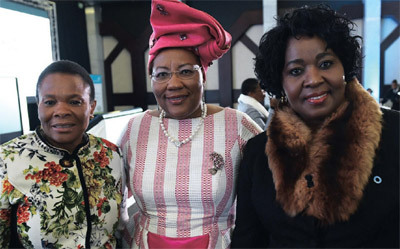 From left, Minister of Women in the Presidency Susan Shabangu, chairwoman of AfroCentric Health Dr Anna Mokgokong, and First Lady Bongi Ngema-Zuma during the inaugural annual women in leadership breakfast. "The power of united women can shake mountains. It can change the narrative of the country and that is what we need you to do," she told a gathering of women at Gallagher Estate. She said the strength of women surpassed all else and could be used to turn the economy around. "Big industry cannot be about men," she said. "Women have to shake it, drive it and own it." Shabangu asked the women gathered at the Inaugural Annual Women in Leadership breakfast where they where when the country nearly got reduced to junk status last year. "The state has been left to men to define," she said. There was legislation that gave women leverage, and which could be used to get them into positions of economic power. "Use them," she urged. Shabangu said patriarchal stereotypes had to be broken, adding that women had the power to change things around. The event was organised by Adcock Ingram and Afrocentric Health, and media partner Pretoria News. In attendance, were businesswomen and chief executives. There were also diplomats, MPs, women in the corporate world and leaders in government in attendance. First lady Bongi Ngema-Zuma and former first lady Gugu Motlanthe were also at the event meant to be a forum for women to network, share ideas and move the country's female population on and up. Discussion around opportunities to lead and be in positions of power dominated conversation, with Statistics SAs Kefiloe Masiteng asking that cognisance be given to the reality that men and women had not started at the same point to reach where they were. "We did not start at the same time, and understanding this allows us to determine if any progress has been made in gender equality." Masiteng said: "There are more working women than men, more elderly women taking care of their grandchildren than men." There were more women in the black population, in the white, Indian and coloured population, she said. "We need to determine what it is that sets the tone for women to be where they should be." Dr Anna Mokgokong made a call to action, and told the women to carry others with them on their way up. Most of the women in the room had already made their mark, she said, and had to own their thrones. "Do not get too comfortable and sleep while you are there. Unleash the power of the throne." Mokgokong, a business-woman, is chairwoman of Afrocentric Health and board member of Adcock Ingram. "Women have been rising by making daring and unconventional decisions, and they make an impact in all spheres like business, medicine and politics." She said they had compassion, co-operation, communication and creativity on their side, and these characteristics were enough to build successful leaders. Mokgokong called on them to use their collective power to break into the leadership sphere. And once they were in power they had to remember to pull other women up, she said. "Do not be blinded by power, there is so much we can achieve together" It was time to stop playing victim and become the victors, she said.